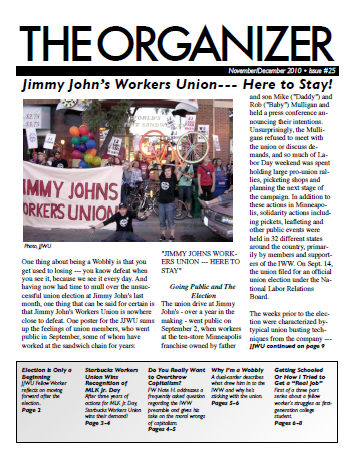 PDF of the November/December 2009 issue of the Twin Cities IWW branch's newsletter. Jimmy John’s Workers Union--- Here to Stay! JJWU Fellow Worker reflects on moving forward after the election..
After three years of actions for MLK Jr. Day, Starbucks Workers Union wins their demand! take on the moral wrongs of capitalism. A dual-carder describes what drew him in to the IWW and why he’s sticking with the union. First of a three part series about a fellow worker’s struggles as first generation college student.